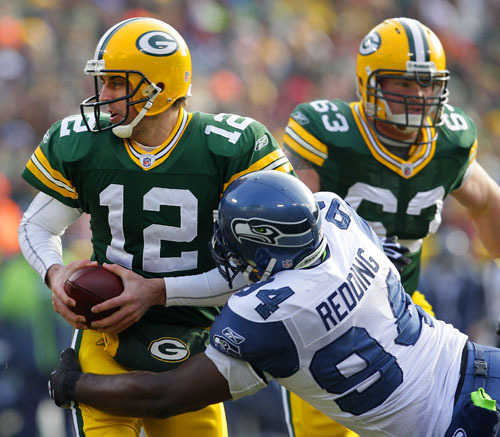 Green Bay Packers defeat the Seattle Seahawks to earn a spot in the NFL playoffs. 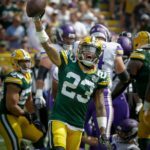 Here are some of my favorite photos from covering the Green Bay Packers vs. the Seattle Seahawks at Lambeau Field on Sunday. 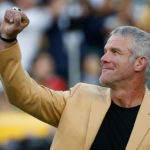 The Packers secured a win in the NFL playoff with the 48-10 win. Most of the scoring happened away from me, but I think I still got some nice stuff including the defense celebrating yet another strong performance with four interceptions. I also spent a little time looking for some non action photos before the game and got three I’m proud of. 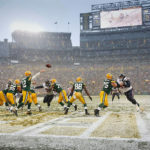 Once the sun broke through the morning fog I was able to make a nice photo of Lambeau Field framed by snow on a tree just outside the parking lot and an interesting photo of a reflection on the luxury boxes. 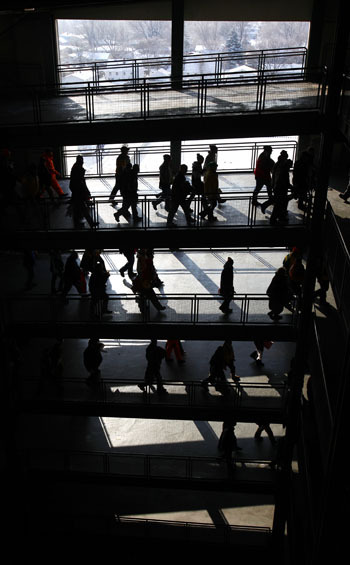 My favorite shot of the day is a silhouette photo of fans making their way into the stadium in the ramps. I like these three shots because they are different and tell the story of a game day away from the field. Plus my editor liked them. If you would like to see more of my sports photography please visit my web site RoemerPhoto.com. Thanks for looking! 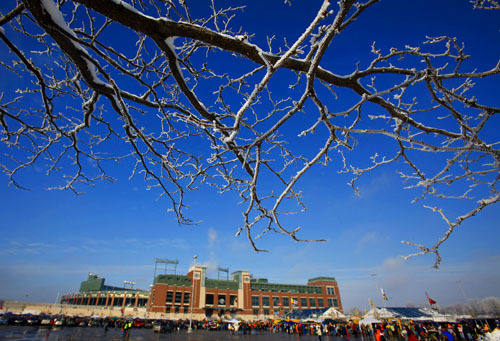 Snow hangs on the branches of a tree bordering the parking lot at Lambeau Field. 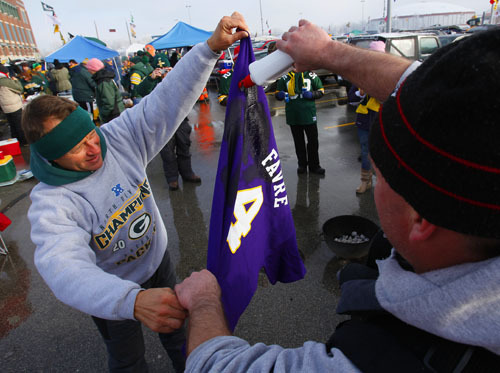 Packers fans pour lighter fluid on a Brett Favre jersey. Packers fans are silhouetted as they head to their seats. 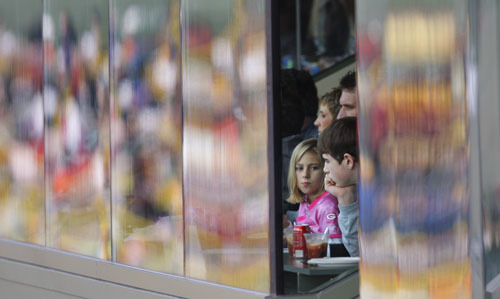 Reflection of the front of luxury boxes at Lambeau Field as fans watch the Packers game. Green Bay Packers Aaron Rodgers tries to avoid a sack. Green Bay Packers Aaron Rodgers looses his grip on the ball. Green Bay Packers Johnny Jolly and Jarrett Bush celebrate an interception. Green Bay Packers Atari Bigby breaks up a pass. 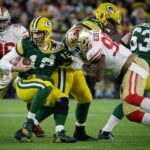 Seattle Seahawks Matt Hasslebeck gets sacked by Green Bay Packers Jarius Wynn and Brad Jones. 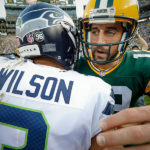 An NFL referee tries to separate Seattle Seahawks Matt Hasselbeck and Green Bay Packers Nick Barnett. Green Bay Packers Aaron Rodgers signals a touchdown as Ryan Grant heads to the endzone. 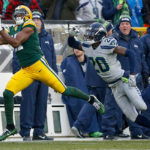 Green Bay Packers Donald Driver celebrates with Packers fans after the Packers defeated the Seattle Seahawks and securing a spot as a wild card team in the NFL playoffs. « Big Win For Wisconsin – Green Bay’s Women’s Basketball Team Over Marquette.